Blueberries are a powerhouse of nutrition. There is alot packed into these little berries. They are full of vitamins and minerals and packed with phytochemicals and enzymes that are great for the body and brain. They are known for their ability to fight heart disease and cancer. They are something that should be part of every diet. 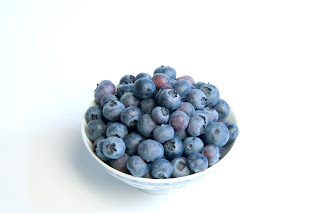 I am talking real blueberries here, not those blueberry flavored bits of stuff you find in cereals and premade muffins. I am talking whole, juicy bluberries. When I buy blueberries they usually do not last more than a few hours. I have three children that love them as much as their momma. We throw them onto our cereal, into yogurt, on or salads (if they make them that far). The kids will just eat them plain. If I buy them in the morning and want them for dinner; I have to hide them in the back of the fridge and hope they don't get discovered. They make for a quick and easy snacks or desserts because they require no real preparation. We love to make pancakes with our natural yeast; add blueberries, and you have heaven on a plate. 7. serve with your favorite toppings. What could be better. Add blueberries and your family will think they have something special. But please do not wait for a special occasion to add blueberries to your diet. whether fresh or frozen, blueberries can be beneficial to anyone's diet. A word about frozen blueberries. Use them frozen if adding to muffins or such, do not thaw. Coat them with a bit of flour first and stir them gently at the end of mixing. Otherwise, the juices run all into your batter you end up with a purplish gray muffin or cake. Whatever you do with them, make sure that you enjoy them often. We added some extra blueberry bushes last year. I can't wait to see how they yield this year. Thanks for sharing on Tuesday Greens! Mmmm, blueberries! Thank you for sharing at Well Fed Wednesday! I love blueberries and try to eat them every day. They really are wonderful for health and taste! I like to sprinkle mine on cereal or in yogurt, but I like baking with blueberries too. Thank you for sharing this post with the Hearth and Soul hop.